THE OTHERS: I love playing bingo! I adore playing bingo! There's nothing in the world beats bingo! What a shame they don't have 'em more often. The more they have, the happier it makes me! Long live the Chinese dogs! Long live the ashtray floor lamps! Long live bingo! Set in a tenement in Montreal in 1965, Michel Tremblay's classic tragicomedy Les Belles-Soeurs ("The Sisters-in-Law") is about a woman called Germaine Lauzon who has just won a million stamps in a department store contest. In order to redeem her stamps for prizes, she needs to paste them into booklets, so she invites a group of her friends and relations over to her apartment for a "pasting party." As Germaine boasts about her good fortune, tensions rise, and her embittered guests plot revenge. Poster designed by Okanagan College Writing and Publishing student Brendan Tomlinson. Sixteen women in a tenement, pasting one million stamps into books so they can be redeemed for prizes – what could possibly go wrong? That’s the premise for Michel Tremblay’s classic tragicomedy, Les Belles-Soeurs (“The Sisters-in-Law”), being produced by Okanagan College’s Red Dot Players. Set in 1965 Montreal, the play is about a character, Germaine Lauzon, who has just won a million stamps in a department store contest. In order to redeem her stamps for prizes, she needs to paste them into booklets, so she invites a group of her friends and relations over to her apartment for a "pasting party." As Germaine boasts about her good fortune, tensions rise, and her embittered guests plot revenge. "On the surface, the characters in the show seem like pretty horrible people," says director Jeremy Beaulne. "They are jealous and combative and nasty to each other. However, Tremblay actually has tremendous sympathy for the women in his play. He wants us to think about the various forces that have circumscribed their lives." Featuring a cast of sixteen portraying female characters ranging in age from 11 to 93, Les Belles-Soeurs promises to be an energetic, engaging production. "It's a very funny show,” says Beaulne, “which has made rehearsals a lot of fun. At the same time, Les Belles-Soeurs also has some really powerful, heartbreaking moments." 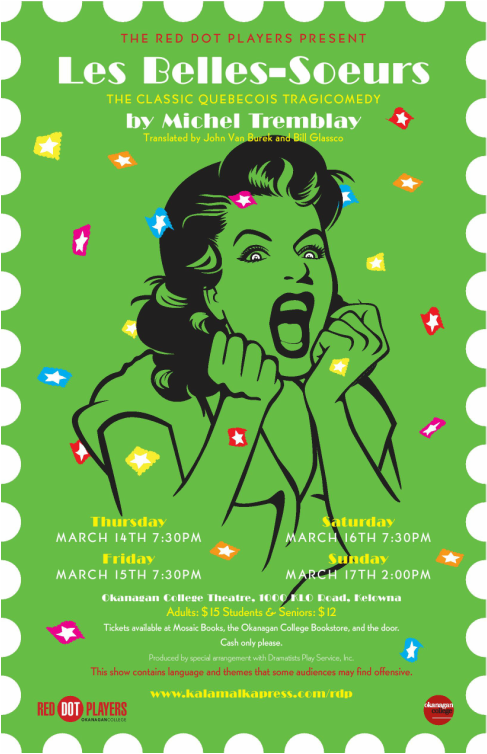 Performances of Les Belles-Soeurs will take place at 7:30 p.m. on Thursday, March 14, Friday, March 15; and Saturday, March 16. There will also be a matinee performance at 2 p.m. on Sunday, March 17. Tickets are available at Mosaic Books, the Okanagan College Bookstore, and the door. Please note that this play contains coarse language and content that some audiences may find offensive.